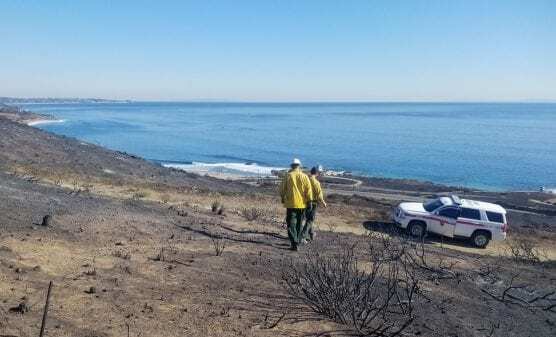 File photo of Woolsey Fire aftermath: NPS. Unified Command has identified properties in the Woolsey fire burn area that may be subject to a high volume of mud and debris flow. Los Angeles County Sheriff’s Department personnel will be out to give residents at the identified properties advance evacuation notice. Mandatory evacuations began at 8:00 a.m. Tuesday. – Communities in low-lying areas or next to steep slopes or waterways are particularly at-risk of falling debris and mud flow. – Residents living in homes with limited roadway access or that can become isolated for an extended period due to the storm should consider leaving before storms arrive. – Homes or neighborhoods with gates should consider leaving them open to avoid being trapped due to mud flow accumulation; even one-inch of mud can restrict gate operations. – If your property becomes unsafe and there is no time to evacuate, seek safe high- ground. – Do not attempt to cross flooded areas and never enter moving water. – Since all canyon roads may be blocked and subject to closure for extended periods, residents should have enough food, water, medication and supplies for at least 7 to 10 days for all family members, including pets and large animals.